High-Heeled Foot in the Door: Color me happy! How sad is it that one of my favorite things from this month's Domino was actually a woman's accessory item and not a home decor one. While this issue did have some good features it was a bit light on new ideas in decorating. 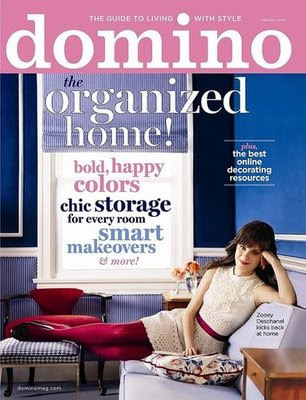 The item that stayed in my memory the most was the front cover with Ms. Deschanel's amazing tights! I love the bright color that she was sporting and how it tied in with the belt she had on. For the last couple of years my go-to outfits has been dresses! Pants are a big pain for me, because I'm on the short side and everything needs to hemmed. Skirts are easier to wear, but then you need to worry about tops so dresses have stolen my heart. They help me look stylish yet comfy and make picking out my outfit in the morning super easy. Due to my abundance of dresses I have also acquired quite the large selection of tights. I pretty much have only stuck to staple colors like black and brown, but the Domino color made me realize that I should embrace color and use it to update some of my outfits and put a little happy in my step! I can't wait to place an order at We Love Colors and put some new life in my wardrobe. They have 45 colors available and are only $12.95 a pair! Decisions, decisions. I know need to choice a couple of favorites and have them sent my way. 45 colors?!? How will you ever decide? I'd never be able to pick just a few, that would be so hard for me. I think they are super cute, but I don't think I am brave enough to pull them off. Love the colored tights. I wonder if I'll get out of my basic black. I swear we are meant to be friends. Literally just this morning I was looking at the cover while drying my hair admiring the tights. I too (being on the short side and having legs that are a different pant size than my waist) am a complete dress girl. It is time for me to venture out! I am following your lead! When I was studying in Budapest, they woudl sell them in the subway(random, I know) and i bought 50 pairs for 20.00 equivalent. I literally tihnk I wore tights almost every day second semester of my junior year of college. Sadly, the all are mostly ripped by now. I'm a "short-stack" too, and have never wanted to draw attention to my less-than-supermodel-length legs....let me know how the tights turn out! Oh my goodness I envy you!!! I have practically NO WINTER DRESSES & really need some. You've inspired me to find a couple. I hate having to make decisions before going out & dresses solve all of that. I'm so glad that you posted this! I loved Ruthie's gentleman's closet but I took note of those tights too! I was going to wear a similar dress with black tights to a valentine's party but now think I'll spice it up with a pair of red tights. good link. I had no idea where I would find them. This is so funny - this is the 2nd post I read to day about colorful tights!! Like you I rock dresses all the time, and colorful tights are my go-to, so I am really happy to learn about "We Love Colors"!